Intracerebral haemorrhage. Section through brain tissue showing an area of bleeding (at centre left) within the cerebrum. Intracerebral haemo- rrhage is a principal mechanism by which stroke can occur. 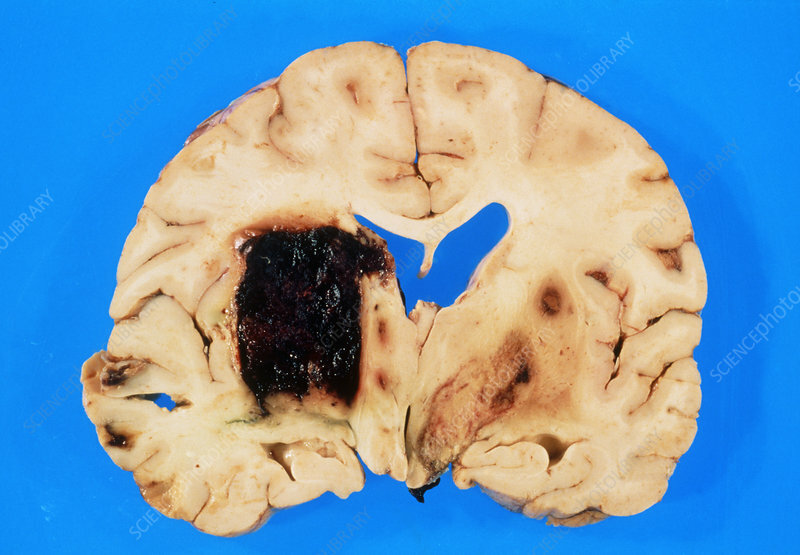 This large haemorrhage has caused brain tissue to be compressed and pushed out of shape. The ruptured artery usually results from hyper- tension (high blood pressure) or atherosclerosis (fatty deposits that narrow the arteries). Most incidents occur in the middle-aged or elderly. Symptoms include sudden headache, numbness, speech loss or facial paralysis, to coma and death. Large haemorrhages are usually fatal. Rehabilitation for the survivor is as for any type of stroke.